We automatically select the deduction that gives you the best outcome on your federal taxes. This year, we estimate that close to 90% of federal tax filers will be better off with the higher standard deduction, up from approximately 70% last year. In TurboTax, you can always switch to a different deduction. However, if you and your spouse are filing separate federal returns, both of you must take the same deduction per IRS rules. Tip: It's best to hold off on switching until after you've finished going through the Deductions & Credits section. That way you can get an accurate picture of how both deductions affect your bottom line. Also, keep in mind that switching to the other federal deduction may impact your state tax return. To find it, be sure you're signed in and that your return is open. You should see 2018 TAXES in your left-hand menu as pictured above (if not, tap or click the upper-left corner to expand the menu or select Take me to my return). From the left-hand menu, select Federal (you might need to scroll down if using a mobile device). Now select Deductions & Credits near the top of your screen. Many people will see Now it's time for the fun part... Your tax breaks (if your screen says something else, skip to Alternate Instructions below). Scroll all the way to the bottom of Now it's time for the fun part... Your tax breaks and select Wrap up tax breaks. (If you don't see this button, select Skip to see all tax breaks, then scroll down again). Continue through the interview until you see the screen pictured above. On that screen, check the box Change my deduction to see the dollar amount for each deduction. Select Continue if you want to save any changes. If you're switching to the itemized deduction, you may be prompted to upgrade. If you come to a different screen after selecting Deductions & Credits in Step 3 above, follow the alternate instructions based on the title of your screen. On this screen, select Edit to the right of Standard Deduction (if you don’t see "Standard Deduction," scroll down, select Wrap up tax breaks, and keep going until you see the screen pictured above. Skip the rest of these instructions). 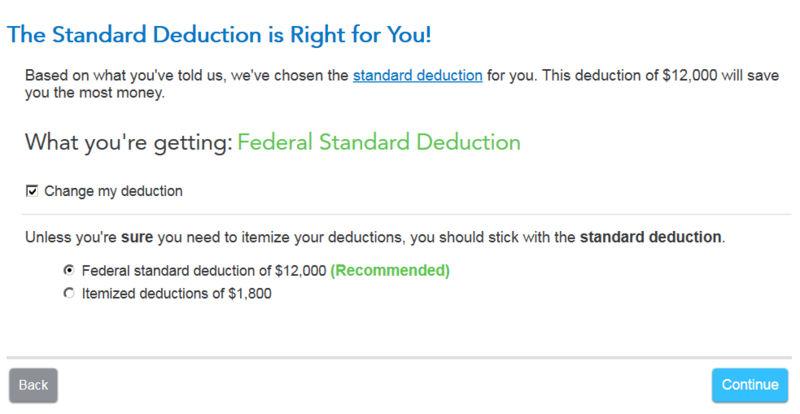 Select Check deductions again on the You’re already getting the biggest deduction screen. Answer the questions about car registration fees, owning a home, etc. At the message Based on what you just told us, the standard deduction is right for you, select Go through itemizations anyway. Keep following the interview and eventually, you’ll reach the screen pictured at the top. On either of these screens, select View all deductions & credits. Select Edit to the right of Standard Deduction (if you don’t see "Standard Deduction," scroll down, select Wrap up tax breaks, and keep going until you see the screen pictured above. Skip the rest of these instructions). Open your return and click the Federal Taxes tab at the top. Home & Business version: Click Personal. Now select Deductions & Credits from the row below the tabs. When asked how you want to enter your deductions and credits, select the button on the right, I'll choose what I work on. Scroll all the way to the bottom of the Your 2018 Deductions & Credits screen and click Done with Deductions. Continue through the interview until you see The Standard [or Itemized] Deduction is Right for You, pictured below. Click Continue if you want to keep any changes. Many (but not all) states let you take a different deduction than what you took on the federal. We have no universal instructions on how to change your state deduction, so we recommend going through your state tax program from the beginning. Look for a screen that asks which deduction you want to take, assuming your state tax laws allow this. The exact placement of this screen varies by state, but most likely you'll find it at the beginning of the interview or right before the deductions section.